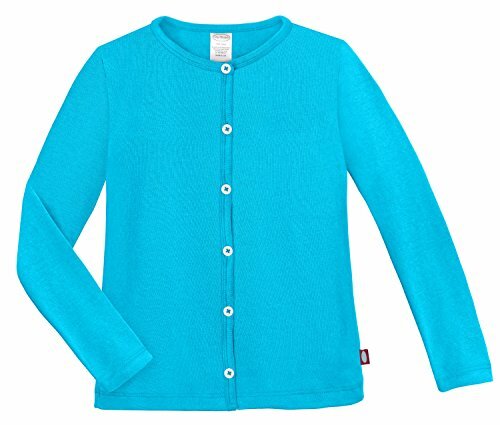 Kids will enjoy this soft and ligh-weight cardigan while parents will love the high-quality fabric, 100% cotton, safe dyes, and Made in the USA tag. It's soft and light-weight fabric makes it a perfect layering piece for school uniforms, great for over dresses or paired with pants. Why are these cardigans so special? Simple, these cardigans are QUALITY items made with the highest-quality materials, highest-quality stitching, safe, comfortable, and made in the USA. Trust us, your child will LOVE them and they will ask to wear them over and over again. The soft cotton baby rib has a slight stretch to it for comfort, and cotton means that it breaths so perfect for moving around all day. They are also great for sensitive skins because they contain no harsh chemicals. There is no substitute for giving your kids comfortable, safe, and good-quality clothes. It may even save you money because these items will last long and be worn a lot! COMFORTABLE - No synthetic or scratchy material in here! 100% super-soft cotton perfect for sensitive skins and children with SPD. The baby rib knit is similar to the soft feel of our famous leggins.